Tofu is a soy product and should not be given to babies with a soy allergy. 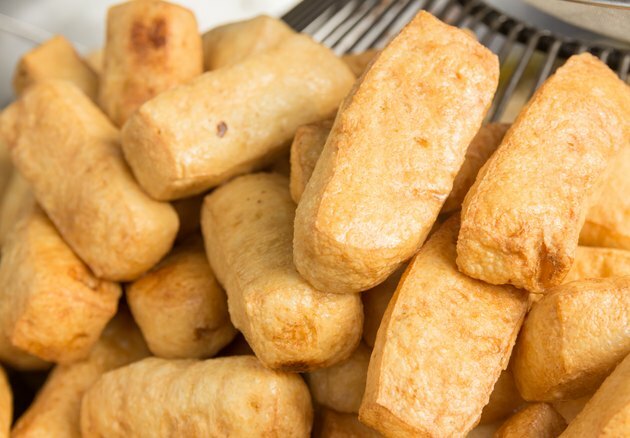 Tofu makes a good finger food because you can dice it small and it is soft and easy to chew. According to Wholesome Baby Food, you can introduce tofu at around 8 months of age. You can store tofu in a container of water in the refrigerator for about 7 days. Change the water daily. Tofu offers calcium, protein and iron and can be cooked many ways for a baby's meal. Try giving your baby plain tofu. Some babies will like the simple flavors of tofu and you can dice it up and serve it as a snack or appetizer. Roll the tofu in crushed cereal. You can crush up some Cheerios and coat small tofu chunks with it and give it to your baby as a snack. Graham crackers or wheat germ works as well. Blend it into a smoothie. Add some tofu, juice and fruit to the blender and whip it into a smoothie. You can serve this through a straw for older babies or feed it to her with a spoon if she can't drink through a straw yet. This is a good way to let a baby practice self-feeding. This works best with silken tofu. Use tofu as a meat alternative. You can add it to soups or mash it with baby cereal to make a tofu burger. You can mix in shredded vegetables and create a well-rounded meal for your baby. Add chopped tofu to pasta sauce as an alternative to sausage or ground beef. Mix with dips. Stir some tofu into hummus, cottage cheese or avocado and serve it with soft vegetables or crackers to dip into it. This is a good mini meal or snack. This is something that can be served to a baby as an appetizer while you prepare the rest of the meal. This is something that transports well for outings or picnics. Tofu comes in three varieties: silken, firm and soft. The different consistencies are used to create different dishes and you can experiment with the varieties to find what works best for you. Premade soy foods are available at most grocery stores. Babies, especially those new to solid foods, should always be supervised while eating in case of allergy or choking. If you notice any symptoms of an allergy, including rash or breathing difficulties, after your child eats tofu, he may have an allergy and you should seek medical attention right away.